The trip for Uluwatu Bali Tour are very exiting combination of Temple, Sunset, beach and landscape. The stunning view from the high cliff are amazing. 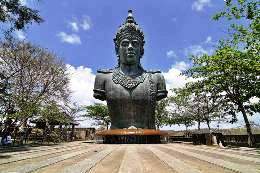 13.00 – Visit Garuda Wisnu Kencana (GWK) Cultural park. 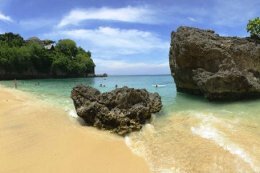 14.30 – Visit Padang Padang Beach. 17.00 – Visit Uluwatu Temple. 18.00 – Watching Kecak Dance and Fire Dance performance. 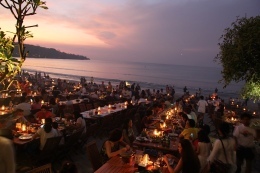 20.00 – Enjoy fresh Seafood Dinner at Jimbaran Bay. 21.30 – Back to hotel. Bali Garuda Wisnu Kencana Cultural Park is an area with 240 hectares of land. There are Supporting facilities that you can enjoy like Lotus Pond, Festival Park, Amphitheater, Street Theater, Exhibition Hall, and Jendela Bali The Panoramic Resto and souvenir shop as well. Padang – Padang Beach is a famous surf point in Bali with the great waves and white sandy stretch 100 meters from the north to the south. This surf point is situated the white stone. 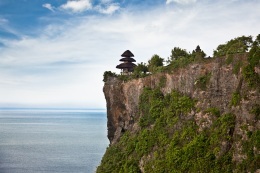 Pura Luhur Uluwatu, one of six key temples believed to be Bali’s spiritual pillars, is renowned for its magnificent location, perched on top of a steep cliff approximately 70 metres above sea level. This temple also shares the splendid sunset backdrops as that of Tanah Lot Temple, another important sea temple located in the island’s western shores. Kecak Dance. “Chark-a, chark-a, chark-a, chark-a”, and on… the chant goes. Almost hypnotic, trance-like, the thirty or so barechested Indonesian men sway with the rhythm. They’re sitting on the ground in a circle – and in the middle the drama is unfolding. Two young princes; a demon king; a damsel in distress; a mischievous monkey. They all play their parts in the ring of unceasing cantillation. Inclusion: Private Car / Minibus (Full Air Conditioned), Petrol, English Speaking Driver, Entrance Fee + Parking Fee, Dinner. 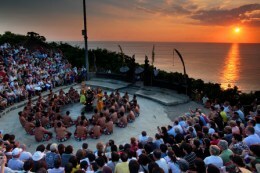 This entry was posted in Things to do, Tour Packages and tagged bali tour, Tour Packages, Uluwatu Tour. Bookmark the permalink.